Etiquette Test For Women Who Know Their Worth: What Are Good Table Manners? Nowadays, many people ignore basic rules of etiquette and think it’s no big deal. And there are those who have no clue as to how to behave in certain situations. Self-respecting people will never neglect the protocols of behavior in society because they know that manners are the face of a person. Our actions, even the most insignificant ones, influence the impression we make on those around us..
Today we invite you to take a quick test and check how well you know table-manners. Look at the picture below. What should you do first after you sit down at the table – tuck the napkin into the collar, put it on your knees or leave it on the table? 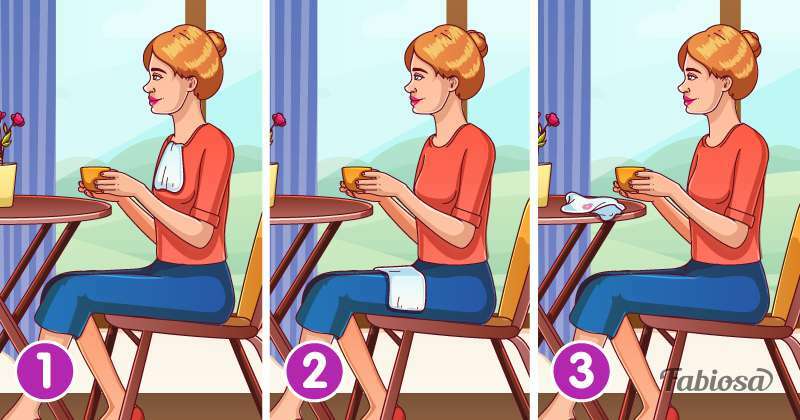 The proper way is to put the napkin on your knees and leave it there until the end of the meal. Tucking it into the collar is bad manners, even if you are going to eat soup. 1. The rules of etiquette forbid sitting at the table with one’s ankles or legs crossed – both feet should rest on the floor. 2. It is considered impolite to photograph the food while sitting at a table in company. 3. Don’t reach across the table to get something from the other end – it is advisable to ask someone to pass it. 4. According to table manners, blowing on hot food in public dining establishments is bad taste; wait a while until it cools down. Did you know these rules of etiquette? Do you always follow them? Let us know in the comments!